No one said being a mom was easy. Especially a mom in the concrete jungle where children's dreams are prescribed. In Urban Momfare, a group of city mothers journey over seventeen years as we watch them fight and claw their way to the top of the supermom ladder. With music and lyrics by Pamela Weiler Grayson and book by Weiler Grayson and Alice Jankell, Urban Momfare highlights the cutthroat women who are solely defined by the success of their children. Young mom Kate finds herself in a battle of mother supremacy in the one-up world of parenthood alongside allies Ellen and Debbie. We watch as Kate and her comrades deal with the enemies, jealousy, and the hardships of parenting all while singing and dancing, poking fun at the elite culture in the concrete jungle. While fun and games, the story has moments of triteness. Overall, the book is a little thin, lacking some important moments to create a complete story and character arc. Spanning seventeen years is a tough feat, especially when the libretto is clogged with more set ups than dialogue. Weiler Grayson's score has some great numbers but as a full cohesive work, many of the numbers felt like standalone songs clumped together for a single piece of theater. One of the strongest songs of the evening came from Christine Toy Johnson's Debbie. The song, about dealing with a child with a problem, is a true tear-jearker but when placed alongside the entire score, the number is the most serious and ends up becoming a more jarring moment than it should be. As Kate, Christiana Little plays the young mom with ease, slowly getting the hang of her new job. Though the focal point of the ensemble, she often gets trumped by Toy Johnson as Debbie and Tiffan Borelli as Ellen, the latter being the humorous comic relief. Sarah Rosenthal as Charlotte, Kate’s daughter, does a nice job with her material, but as the only extension character of the main cast, the character’s presence does little to progress the story and could be eliminated completely. Director Alice Jankell does a fine job bringing her ensemble to the funny level. She discovers the balance between comedy and heart. Though as the play takes a turn to the less funny, Jankell still manages to work out any laughs possible. The set by Tim McMath was a sextet of gold chairs with camo cushions that recycled into every location of the play. The costumes by Nicole Wee were simple and highlighted the bold characters for the trio of ladies playing various roles. Projection designer David Bengali helped define the passage of time during the show but the accompanying music attached to the slide show felt like the music actually attached to the program and not the production. 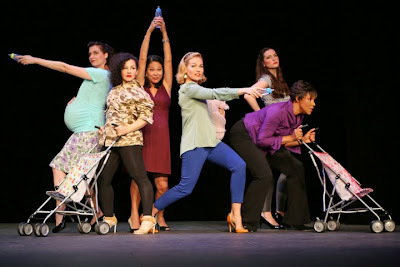 For the most part, Urban Momfare is a witty musical geared and pandering toward a very specific audience. It's endearing and filled with heart, but may not land with an entire audience. For a musical about a group of women who are defined by their children's success, Urban Momfare is campy fun that punches with comedic jabs to the outrageous lengths mommies will go.